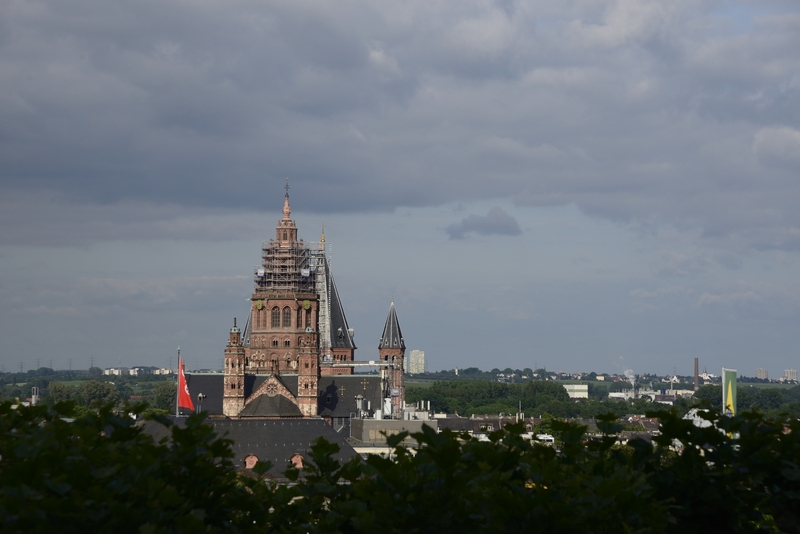 The Mainzer Dom or Cathedral of St. Martin looms over the relatively small city of Mainz. The staircase towers on the east, shown below, date to 1009. The east choir and nave were complete by about 1137. Though the building has too often suffered from fire, neglect, war and now the ravages of modern civilization, it remains in use as a center of Christian worship. As a point of comparison, by the time the Roman monuments were 1000 years old, they were ancient ruins, looted for their stone and their original purposes of little interest to the new residents of Rome. In addition to its age, the size of the building is hard to grasp. 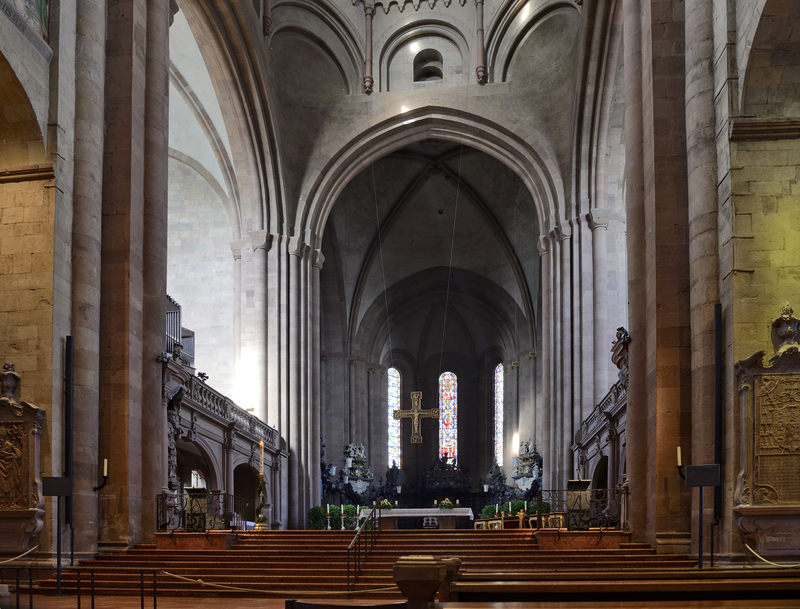 It is 109m (357ft) long and the nave is 28m (98ft) high. With the aisles the church is 32m (104ft) wide. Though a bit smaller than its Gothic successors, it till whelms the senses. 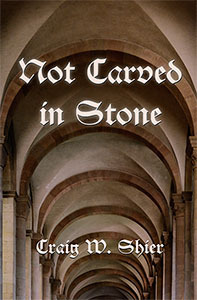 The core of the building is in the Romanesque style, marked by round arches and heavy, thick, flat walls. The windows are small, letting in but little light. The overall effect has been considered gloomy, but I’m not sure that gives proper credit to where this style fits in the development of architecture. If one had never seen a gothic church, with its skeletal frame and glass walls, this would seem spacious and light enough. 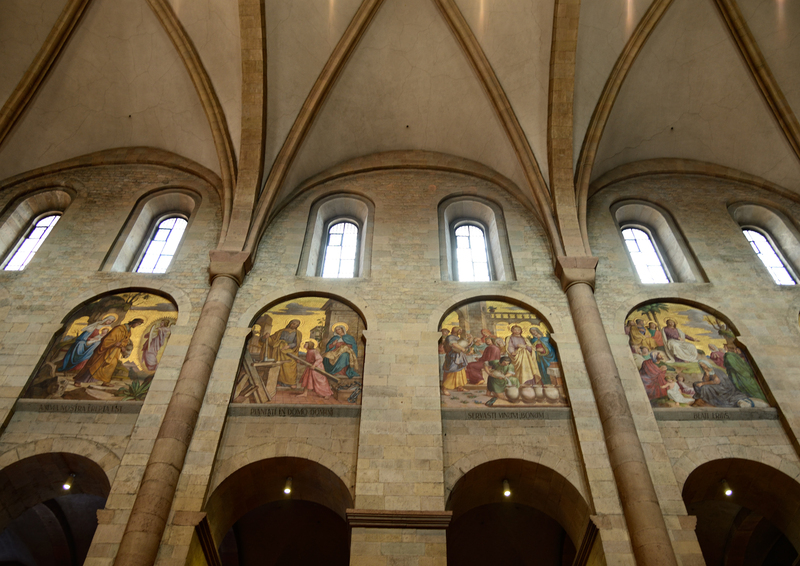 The blind arcade between the nave arches and the clerestory windows, which is adorned with paintings from the Gospels, was an innovation at the time. The original building had a flat ceiling. 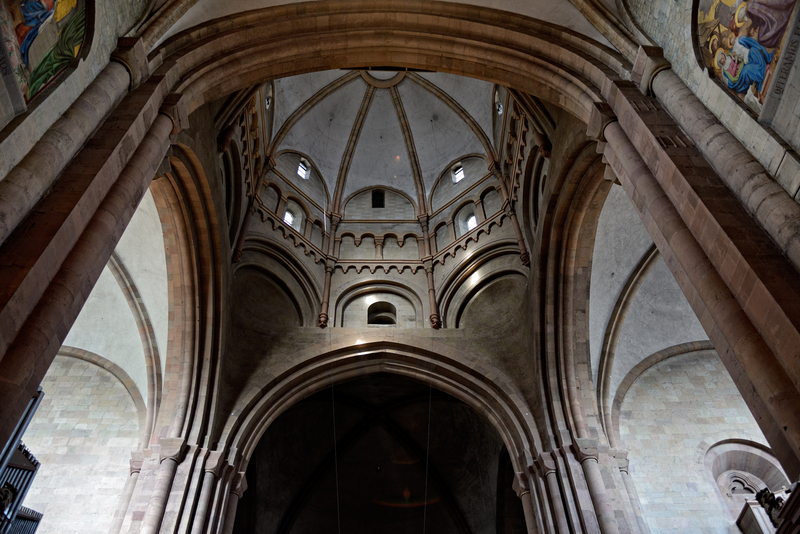 The ribbed vaulting was installed in the late 12th century. 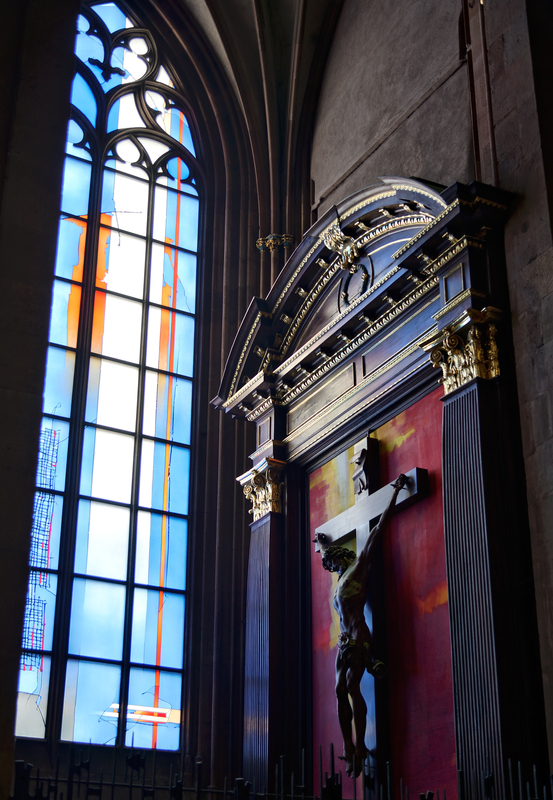 This innovation seems to have come late to the Rhine churches. 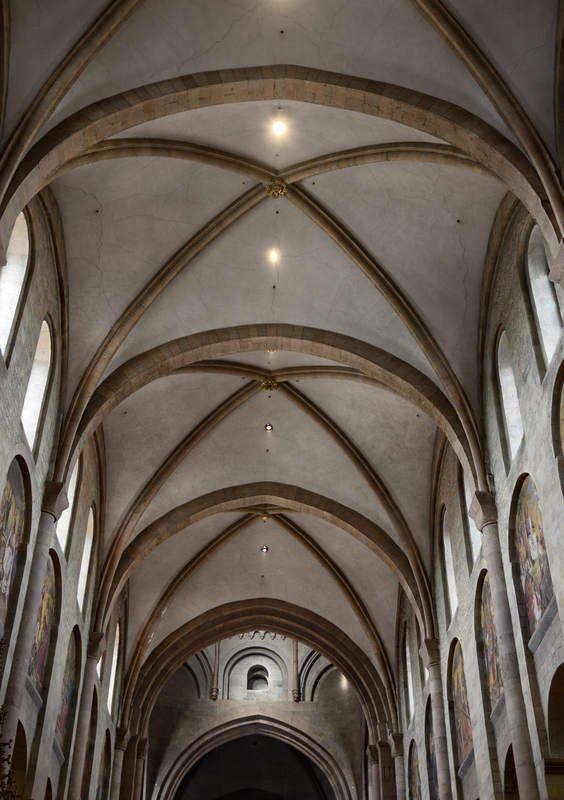 Such vaulting was already in use as early as the 11th century in England. The half-cylinder columns added to the inside of the rectangular columns support the vaults. A number of german churches built in this time period had chancels/apses on both the west and east ends. In the case of Mainz the more elaborate chancel, is in the west and the pews face that direction. The Romanesque core has been obscured somewhat by later accretions. 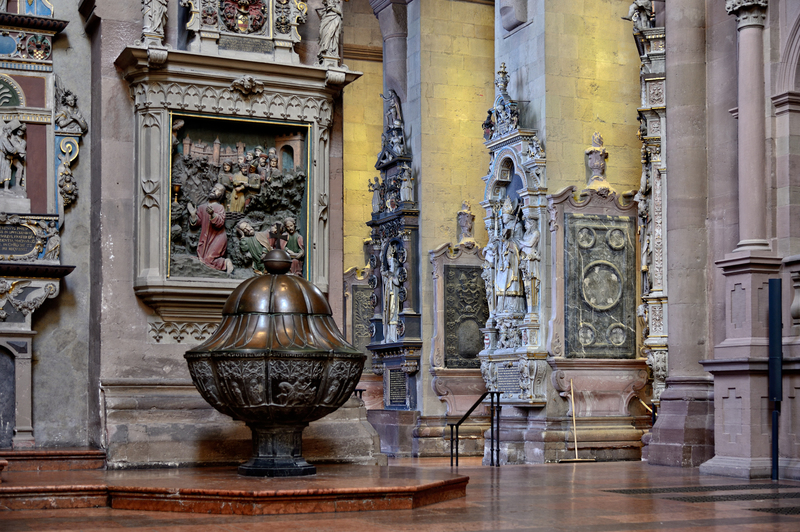 Numerous monuments and decorative additions come from the high gothic and baroque ages. The transepts especially have numerous memorials in later styles (note also the early 21st century push-broom resting against the column in the background). 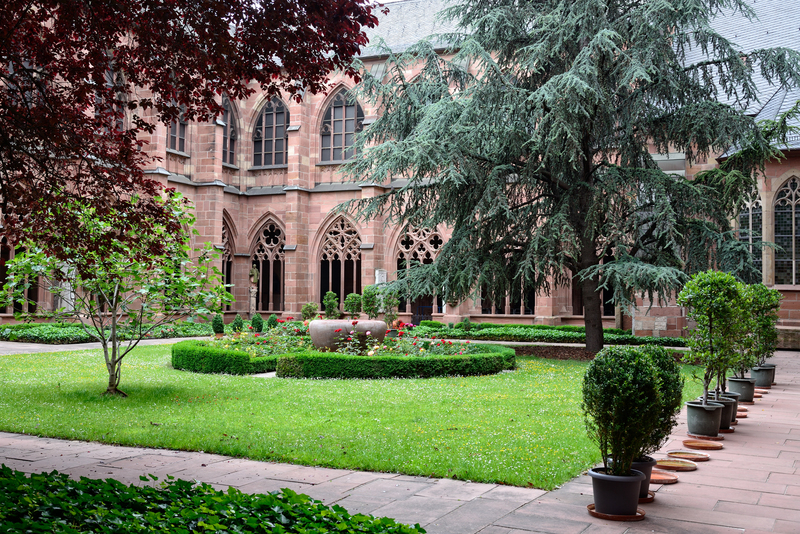 Chapels, funded by noble patrons who wanted to memorialize themselves, were added in the 13th century with large gothic windows, seen from the cloister in the image below, but many of these are shaded by buildings around the cathedral and do not add much light to the interior. This issue of patronage also gives one pause to consider the mixed personal and religious motives of donors. Still today there are further additions, including a number of modern colored glass windows that to my eye clash a bit with the older elements. Most other large churches from this age in western Europe were replaced at one time or another with newer, gothic structures. 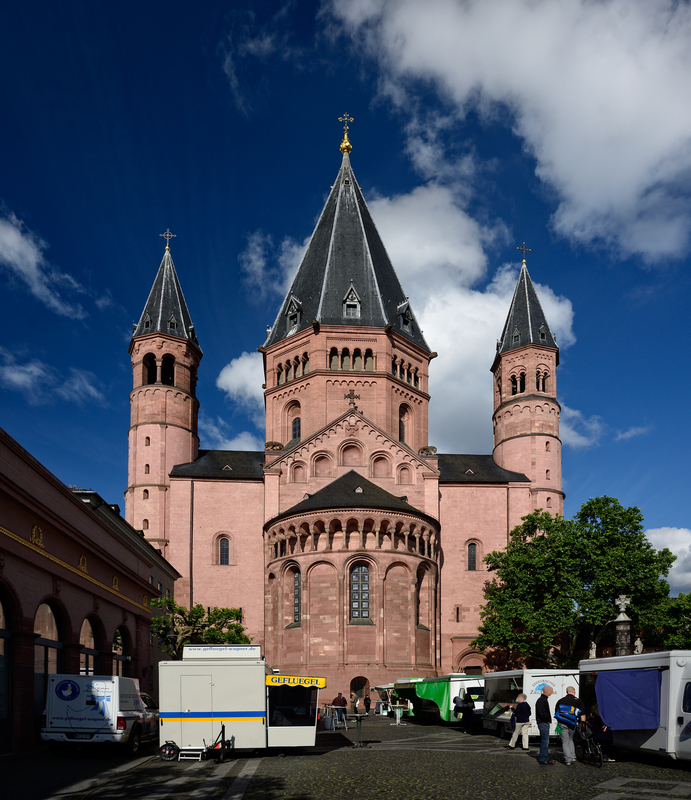 Together with Speyer and Worms, this church is a special representative of an important architectural style and a testament to the faith of those who built and rebuilt it.